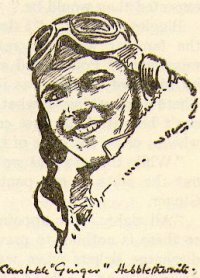 Ginger is the protégé of Biggles, hero of the adventure books by Captain W E Johns, and first makes his appearance in The Black Peril, as a lad of fifteen or sixteen. Out of ninety seven books, Ginger appears in all except thirteen. Over the span of books Ginger gets his tickets and slowly matures from the resourceful child he was when he first met his hero, through an adolescent with a childlike interest in everything new, into a trusted comrade who is Biggles' chosen companion more often than not for the second seat in the cockpit.